Today I have the Nine Zero Lacquer The Accent Glitters collection to show you! This is either perfect timing or horrible timing because I just noticed that only two of the Accent Glitters are in the Last Call section of the Nine Zero shop and the rest have sold out! My bad! 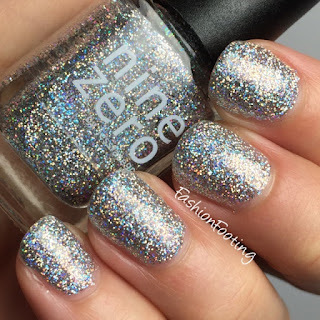 Diamond is a silver holographic glitter. 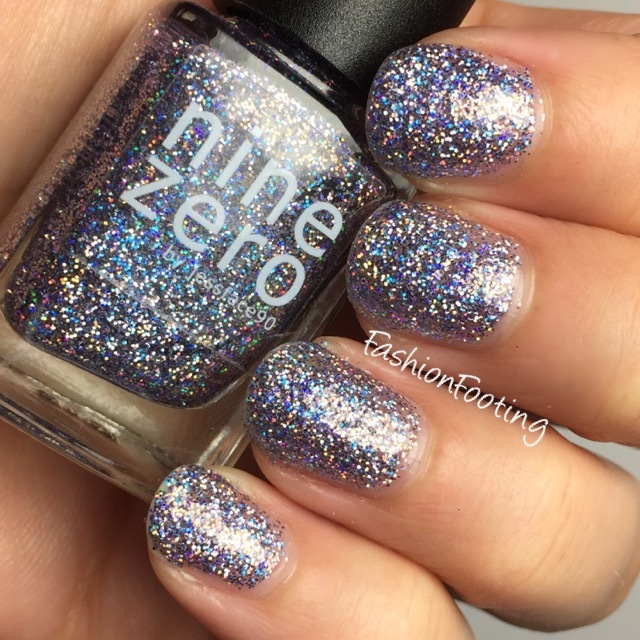 This is 2 coats and in person it is not completely opaque but it's so sparkly that it looked opaque enough for me to call it good. One coat of topcoat. 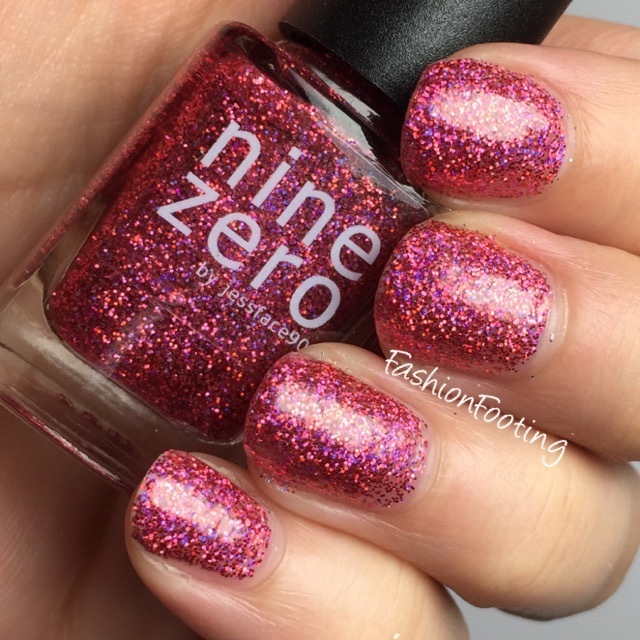 Rose Quartz is a light pink holographic glitter in a clear base. 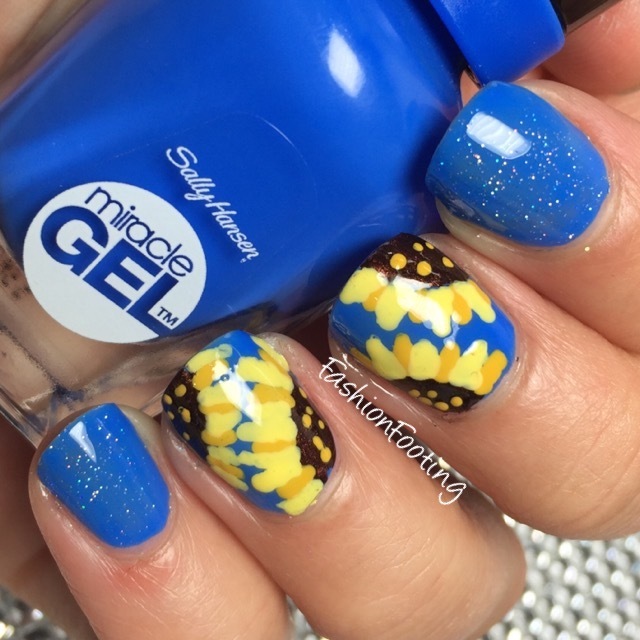 This was another that was 2 coats but for complete, 100% opacity needed a third but I stopped at two. All of these glitters are incredibly holographic so they look like they are completely covering, even though you can make out a few tiny gaps if you look closely. Plus topcoat. Amethyst is a light purple holographic glitter in a clear base. The same goes for this as the previous two: 2 coats, but probably needed 3. Plus topcoat. Ruby is red holographic glitter in a clear base. I did 3 coats plus topcoat for this (and the rest of the polishes). I must have been lazy for the first 3 LOL!! 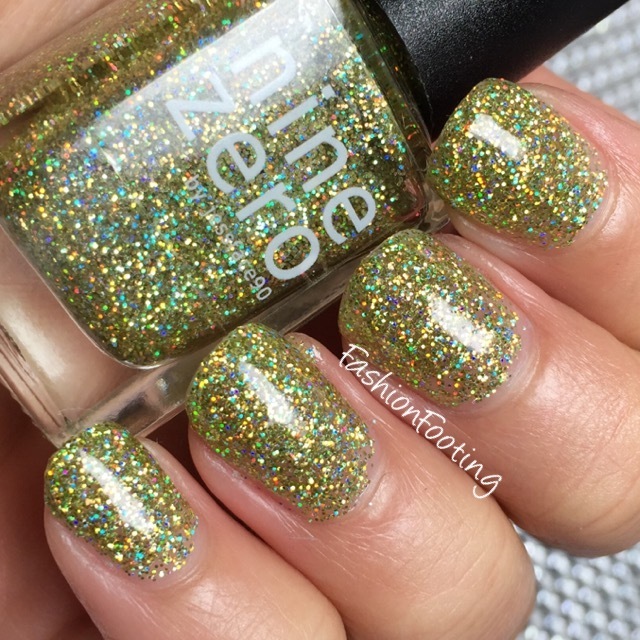 Citrine is a yellow green holographic glitter in a clear base. This was 3 coats, plus topcoat. 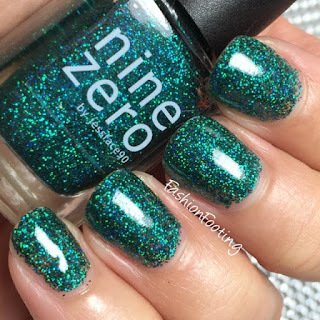 Emerald is a teal green holographic glitter in a clear base. 3 coats, plus topcoat. 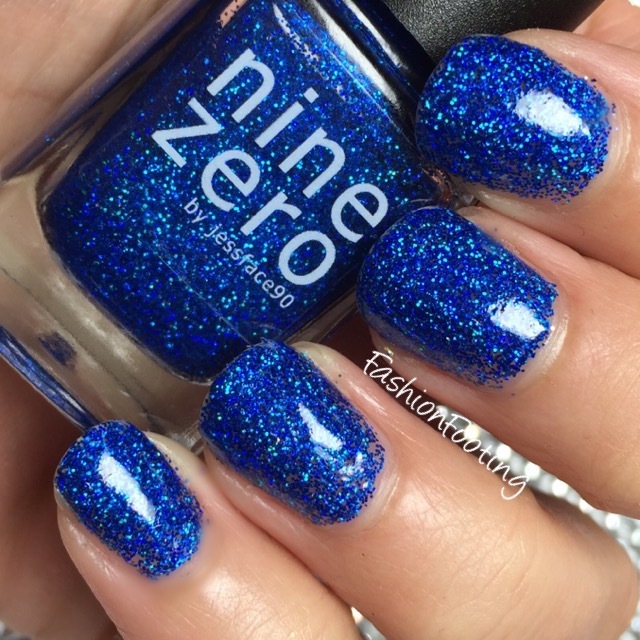 Sapphire is a cobalt blue holographic glitter in a clear base. 3 coats, plus topcoat. 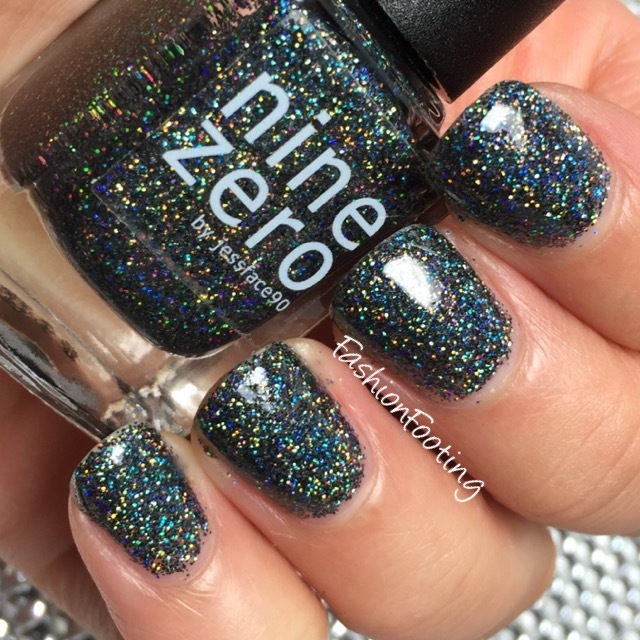 Onyx is a black holographic glitter in a clear base. 3 coats plus topcoat. So as I mentioned, only two of these polishes are currently available (Rose Quartz and Citrine), which is unfortunate because they are beautiful. 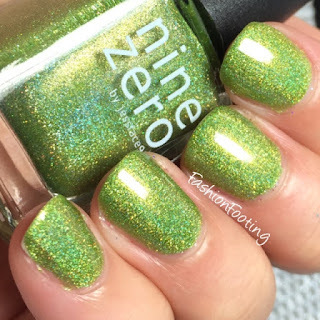 I still love accent glitters, even though I greatly neglect mine. I think I shall revisit some glitter/creme polish combos soon! I was recently sent two topcoats from Sally Hansen: The Big Shiny Top Coat and the Big Matte Top Coat. 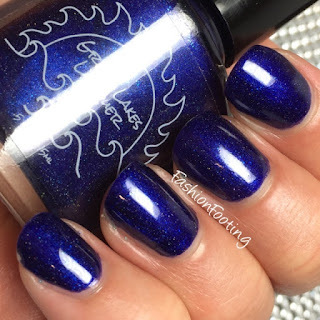 Personally, the look of flakies mattified is just so lovely to me so I definitely wanted try this matte topcoat out with Great Lakes Lacquer I Left My Heart At Houghton, which I posted yesterday. I applied one coat of the matte topcoat over the GLL and waited a few seconds. The matte topcoat dried very quickly and and evenly. I wore the matte topcoat for about 3 days and didn't have any chipping, which is very impressive for my nails! The Big Shiny Topcoat is a pretty standard, but good topcoat. I didn't notice anything exceptional about it, other than it covered nicely without any lumps or bumps or streaking in one coat. 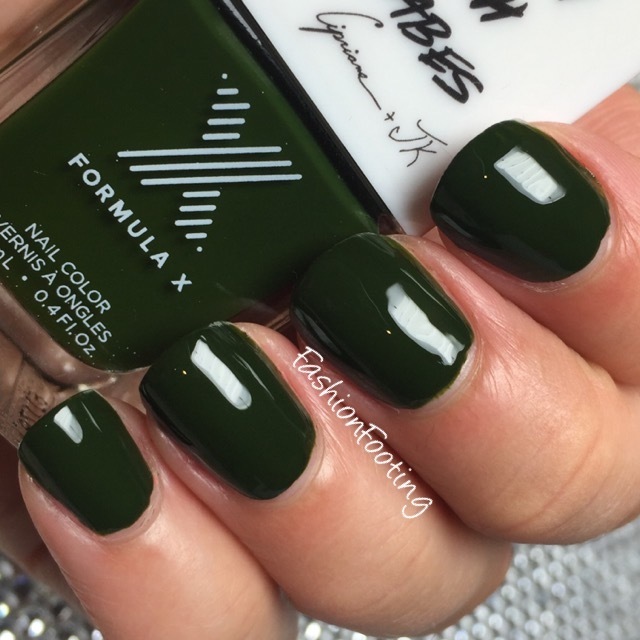 Have you tried either of these topcoats? What did you think? Great Lakes Lacquer August Limited Edition Polishes! 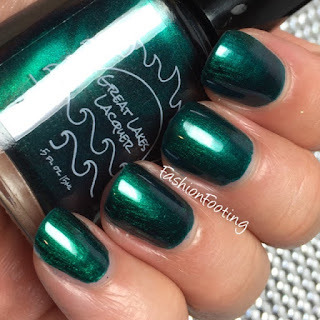 Today I have both of the Great Lakes Lacquer monthly limited edition polishes. 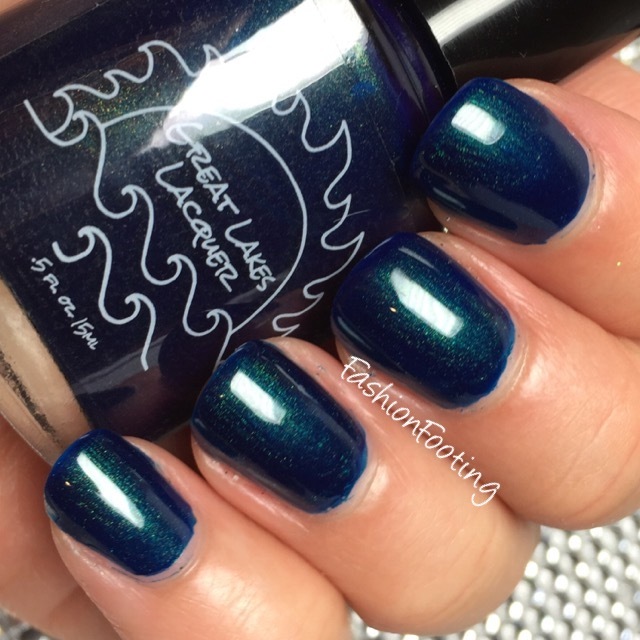 First is The Waters of Torch Lake, a gorgeous aqua blue with blue shimmer. 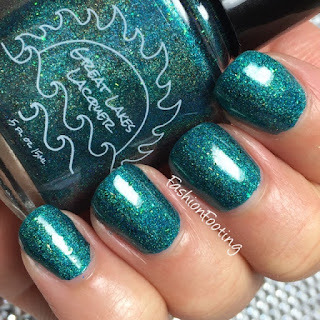 This was two coats and had a great formula. Maybe slightly a bit thick, but I love thicker formulas. I added a topcoat, by the way! Next is I Left My Heart At Houghton, a completely beautiful periwinkle with small silver flakies. This was 2 coats and topcoat and OMG I love this so much. The August polishes will be available through August so be sure to make your way over to Great Lakes Lacquer and pick these up before the month is over! Today I have the 6 piece collection from Orly for fall 2016, called Mulholland. I know I've mentioned before that ever since Orly rebranded, I've been consistently impressed with their collections. It's so nice to see 6 piece collections. Larger collections seem overwhelming to me, lol. Mansion Lane is a dark grey creme. This is 2 coats, plus topcoat. A nice formula, no pooling or running. It was the tiniest bit thin but that is just based on my preference for polishes. Cahuenga Pass is a tomato red jelly. This is 3 coats plus topcoat. I don't think this is a very fall like color, but I LOVE it! Great formula, as well! Hillside Hideout is a deep mauve with gold shimmer. This was another with a great formula and opaque in 2 coats, plus topcoat. 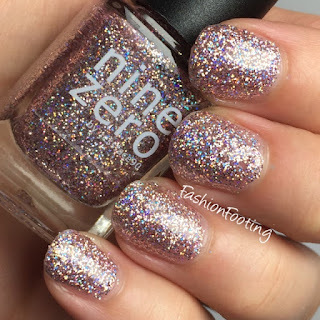 Million Dollar Views is a golden coppery color with gold glitter. This was 2 coats, plus topcoat. Now, I know what you're thinking: doesn't this look exactly like Orly's Rage? I thought the same but no, Rage is more pink and has no glitter. I even took a comparison swatch for you! MDV on the index and ring finger, Rage on the middle and pinky. They look even more different in person and both are completely lovely. Party In The Hills is a black and gold microglitter in a clear (or possibly slightly tinted base). 3 coats, plus topcoat. The glitter wasn't quite as dense as I prefer for glitters but again, that's just my preference. Meet Me At Mulholland is a brown shimmer with orange and purple flakies. This is 3 coats plus topcoat. What's your favorite from this collection? I personally love Cahuenga Pass and Party in the Hills! Another NOTD today! This is Revlon Colorstay Gel Envy in Showtime. I have acquired quite a few of these Revlon polishes and I quite like them! Showtime is a beautiful blurple (blue/purple) with small flakies and microglitter mixed throughout the polish. This was 2 coats, plus topcoat. 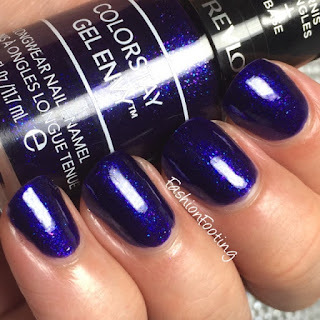 Do you like the Colorstay Gel Envy line? 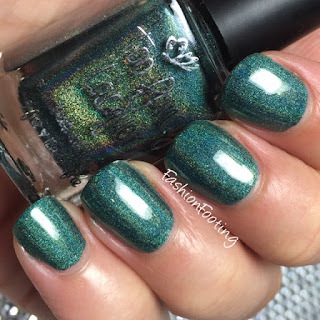 I have all OPI swatches to show you this week! The first is an oldie but a goodie and new to my collection. I was given this by my friend Jamie a few months ago and finally pulled it out of my untrieds bin. This is Ginger Bells, a beautiful dark orange (ginger, if you will... heehee). 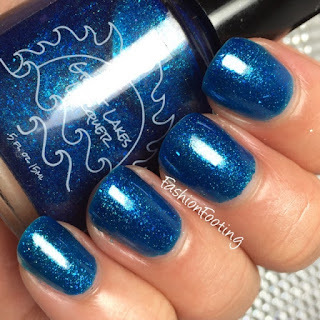 This is an older polish but has a great formula. This was two coats plus topcoat. Do you have this beauty? What do you think?? A quick NOTD using a polish I recently purchased from the clearance section of Sephora. 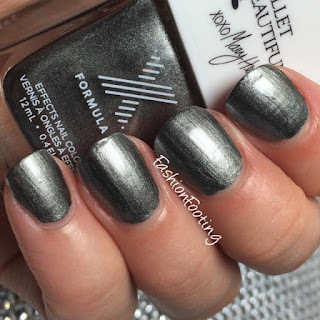 This is Formula X Ballet Barre, a silvery gunmetal metallic polish. I don't have a ton of colors like this and I was intrigued. This was two coats plus topcoat and the bumps on my pointer and ring finger are on my nail and no fault of the polish!